of prayer, in honor of and protection of the ancestors at Sogorea Te. At this time, we are re-issuing the urgent call for people to join us at Sogorea Te who are able to commit themselves to being present on the land for 3 days to a week or more, in support of the ongoing ceremony. Please contact us if you are in need of assistance with transportation. Its been a busy week. 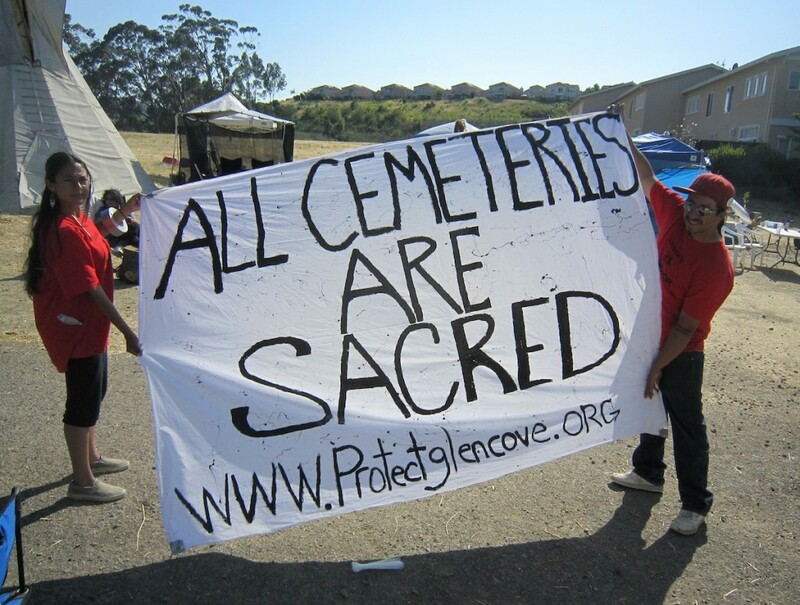 An independent group of supporters has been organizing in solidarity with our work to prevent the desecration of Glen Cove. 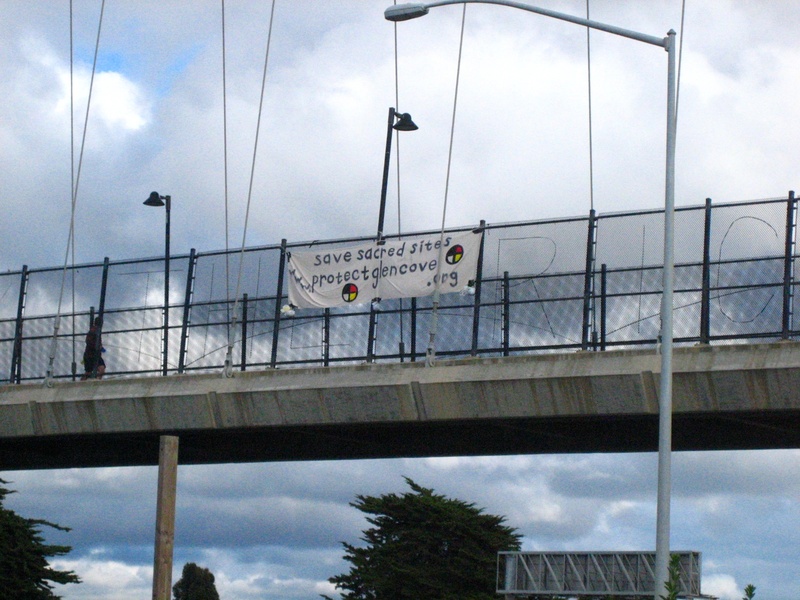 At 8:00am Tuesday morning, 60 people picketed outside the offices of the Bay Trail Project in downtown Oakland, demanding the withdrawal of all financial and political support for the proposed GVRD development plan. Bay Trail, a local non-profit, has contributed upwards of $200,000 to the Glen Cove park project and is directing the installation of new paved trails through the area. Click here for photos and a report-back from Tuesday by the Glen Cove Solidarity Working Group. 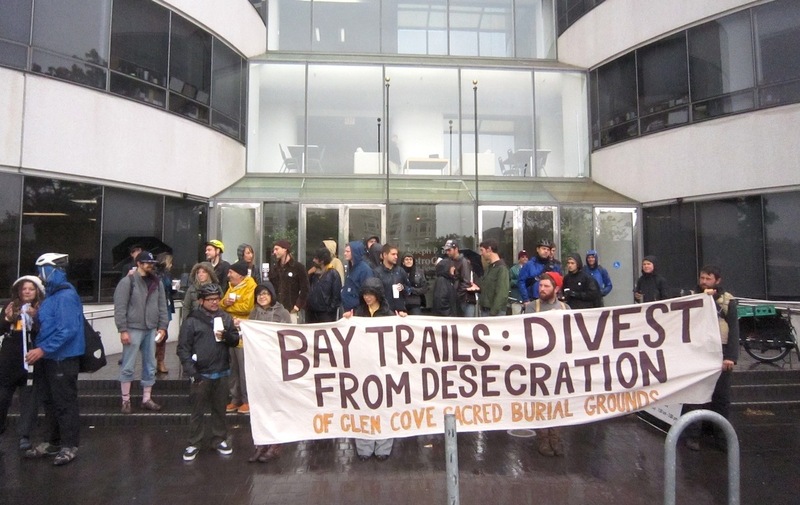 As a result of this solidarity action, executive directors of Bay Trail contacted the Protect Glen Cove Committee, asking for a meeting the following day. 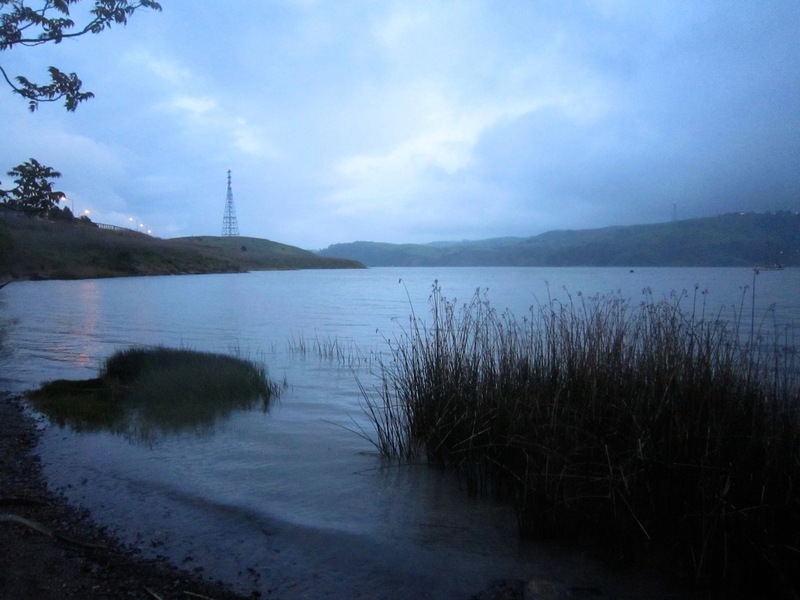 Bay Trail had previously declined the committee’s requests to meet. At noon on Thursday, a productive meeting took place between Bay Trail directors/managers and the Protect Glen Cove Committee. The Bay Trail representatives listened closely and expressed serious concern about continuing with their project at Glen Cove as it currently stands. They are now reviewing options and will be contacting the committee early next week about their stance. On Tuesday afternoon, Shane McAffee (General Manager of GVRD) entered the grounds of Sogorea Te with a video camera and a smirk. 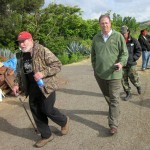 McAffee was accompanied by a man who identified only as Dennis. 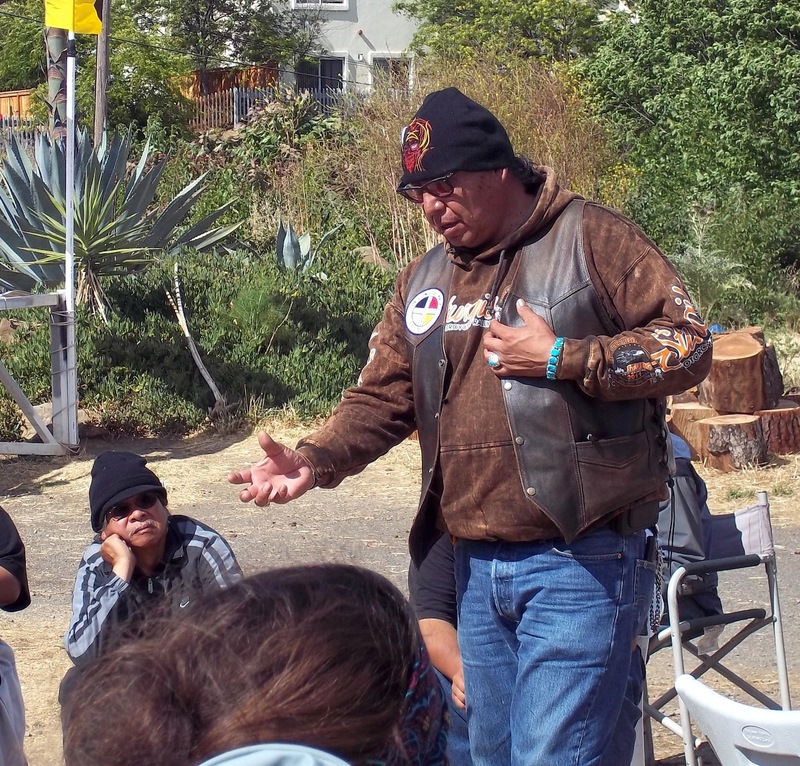 They spent time looking at some of the most culturally sensitive areas and speaking rudely to participants in the spiritual encampment before leaving. 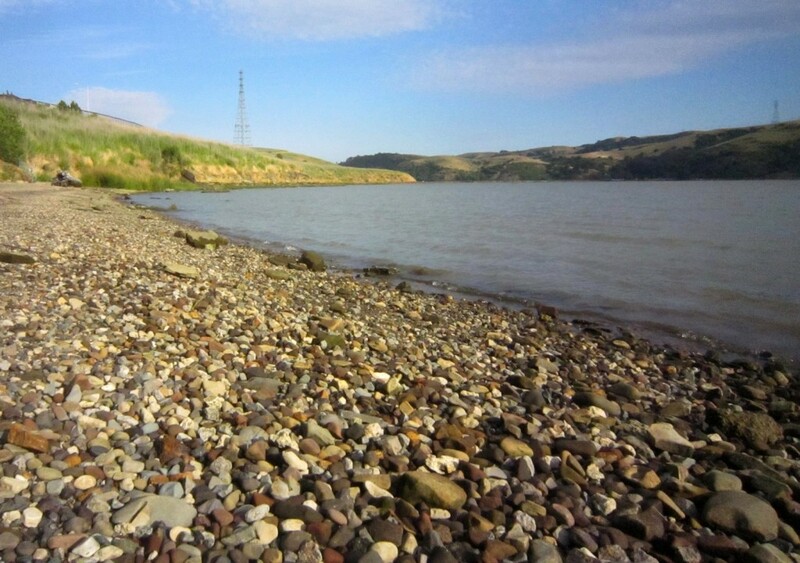 On their journey from the ocean, all the Salmon headed up the Sacramento River to Wintu territory must pass right by Sogorea Te, through the bottleneck of the Carquinez Strait. 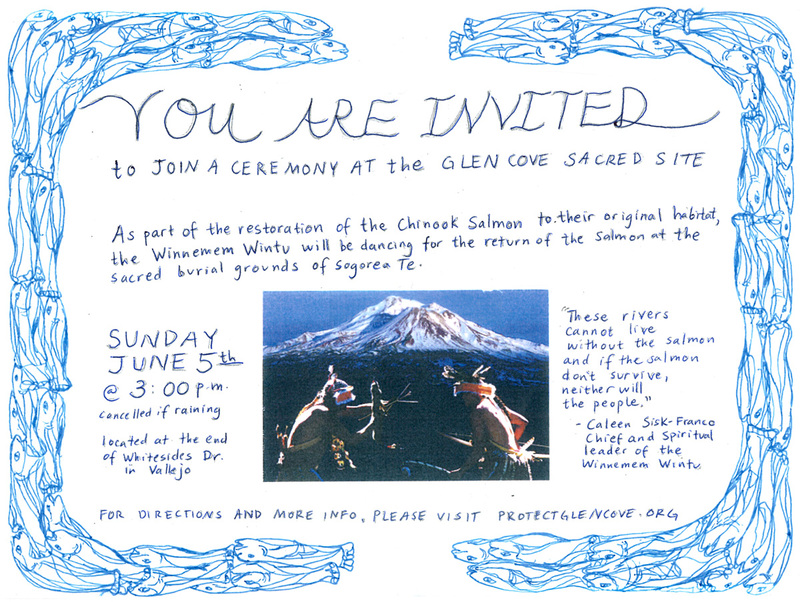 The Winnemem Wintu are planning to hold a ceremony for the Salmon at Sogorea Te on Saturday, June 4th around 3:00, provided that it does not rain. On Wednesday afternoon, Merle Whistler (Lakota) led a healing ceremony with all who were present around the sacred fire. In the evening, Jason Cerritos (Mono & Wukchumni) and Leonard and Dylan Pineflower (Yaqui/Apache) visited from the Central Valley. 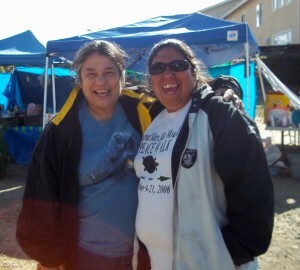 They joined in singing California songs with clappers and the Sogorea Te, AIM, and Leonard Peltier songs on the drum. 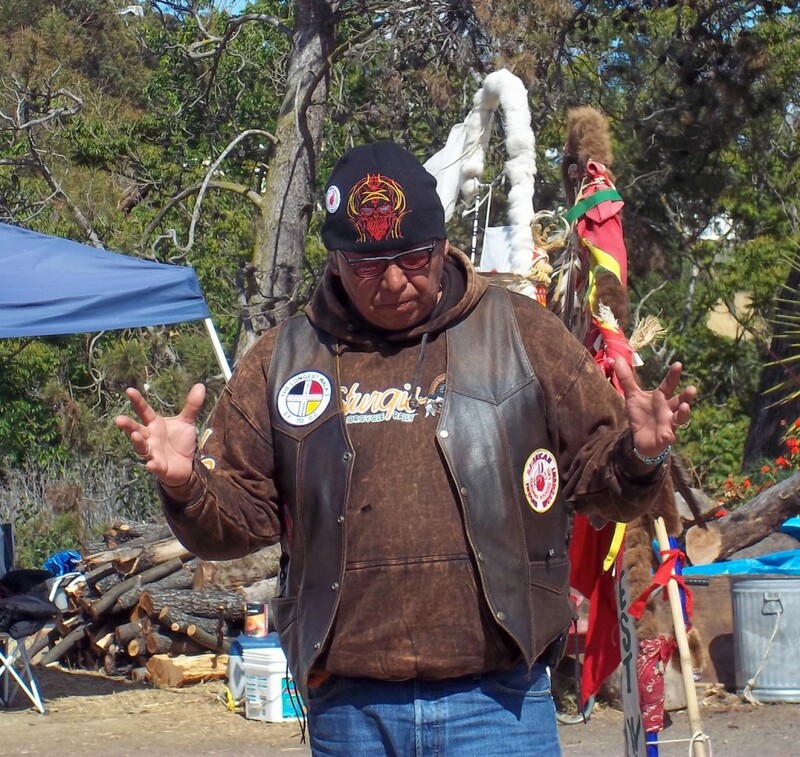 Wounded Knee DeOcampo (Miwok) and Fred Short (Ojibwa) spent all of Thursday visiting traditional spiritual leaders at rancherias and reservations throughout Northern California, bringing offerings and asking for support in protecting the sacred burial grounds of Sogorea Te. Out of these visits grew the inspiration for a spiritual gathering that will be taking place at Glen Cove on Saturday, June 11th. A benefit concert with punk rock bands was held in San Francisco on Thursday evening. Money was raised for the Glen Cove emergency defense fund, and Michelle Steinberg, drummer of Somnolence and participant in the spiritual encampment, spoke to the crowd about the current situation at Sogorea Te and ways to show support. 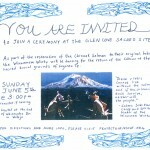 The Winnemem Wintu will be holding a ceremony for the Salmon at Sogorea Te on Saturday, June 4th around 3:00, provided that it does not rain. This weekend, folk guitarist/singer David Rovics is planning to visit and share songs at Sogorea Te. Specific time TBA. A spiritual gathering will be held on Saturday, June 11th at Sogorea Te. All are welcome. Firewood and food supplies are running low. Please donate if you can! 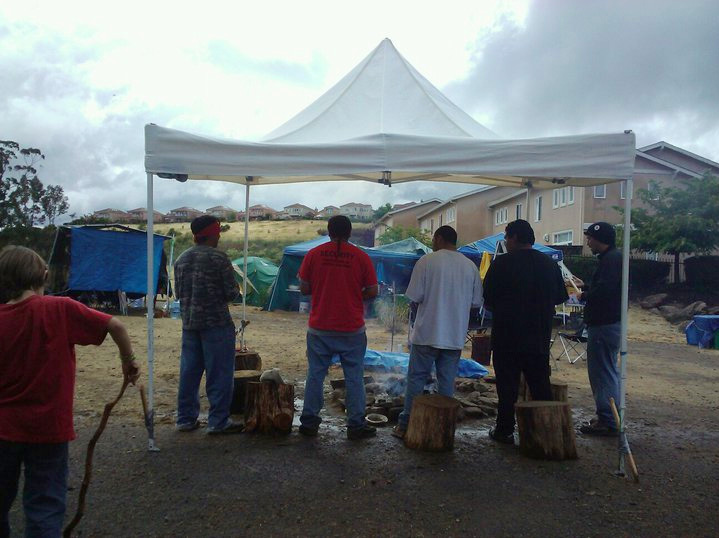 We are in urgent need of committed people who can stay on the land for 3 days to a week or longer, in support of the ongoing ceremony to protect and honor the ancestors. Please contact us if you are in need of assistance with transportation. 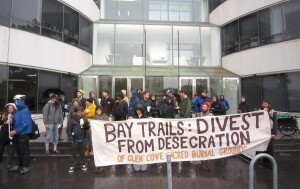 5/31 demo at Bay Trail offices in Oakland, organized by the Glen Cove Solidarity Working Group. Ohlone, Pit River, Wintu and Mono songs being shared in prayer. Please ck. out this site, and there is another fight going on at Bear Butte, S.D. 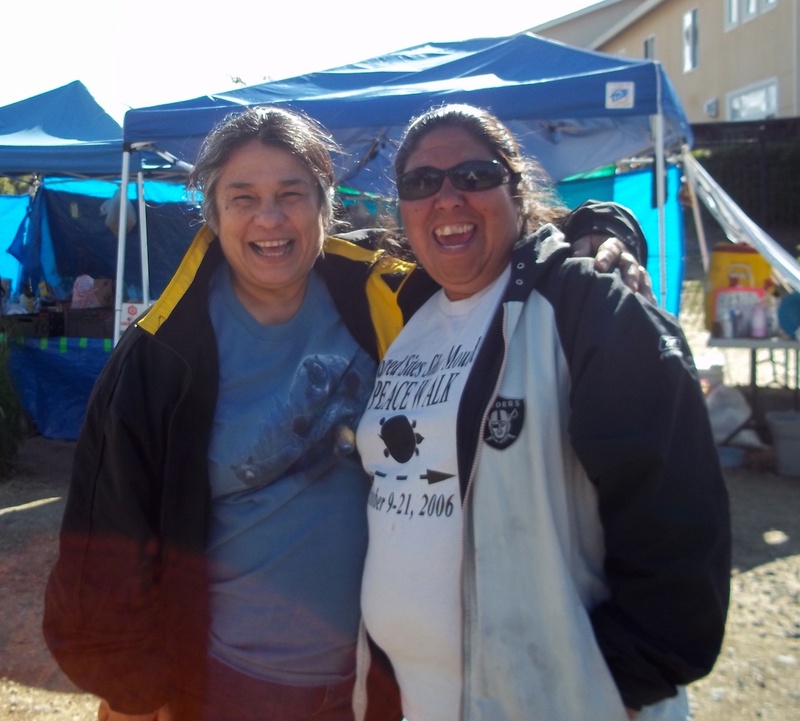 Mr. James Magaska Swan is spear heading this rally…and as NDN’s we support your endeavors! Keep up the fight!! !